This week I played both the Thanksgiving and Sunday afternoon slates (including SNF). For Thanksgiving, I played one cash lineup in three 3-man competitions. I also played two lineups in a few quarter arcade GPPs (one of which was the same as my cash lineup. Both of the lineups performed well, with a focus on what I expected to be the higher scoring games of the day. Lineups are below, cash on the left, GPP only on the right. This was a good day in DFS, winning all of my cash games and placing all four of my quarter arcade lineups. I continued to play one roster, across eight total cash games; five 3-man contests and three double up contests. This was a mediocre week for me — primarily due to a Russell Wilson / Doug Baldwin stack against TB that under performed. 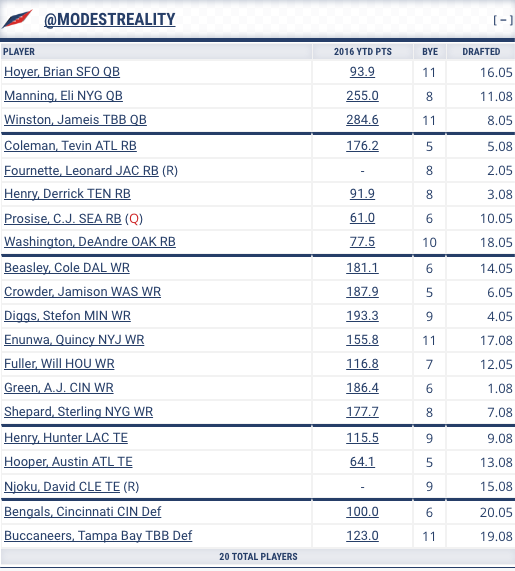 I also missed on a few value picks including Sterling Shepard against CLE, Tyler Boyd filling in for A.J. Green against BAL, and Tajae Sharpe against CHI. I also dropped five entries into a quarter arcade, one of which placed decently. 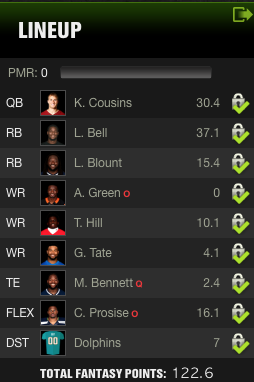 I won 25% of my cash contests and placed one of the quarter arcade lineups, which salvaged this slate a bit. This week I scored 119 points and was one of the lowest scoring teams this week. It’s the tale of this season — an inconsistent team that has the potential for big points but a lower floor than I would prefer. I generally felt good after the Thanksgiving games — driven by solid games from Dak Prescott, Kyle Rudolph, and Jamison Crowder. However, the Sunday games drastically underwhelmed. Both my wide receivers had poor games — with a combined 8.75 points between the two and both of my RBs merely hit their floors. With this loss, I remain in fourth place with a 7-5 record. I am playing the third place team next week in a must-win situation. At 112 points — I scored in the middle of the pack this week. This match was absolutely carried by lights out performances from Kirk Cousins and Antonio Brown on Thanksgiving. The remaining players on Sunday largely underwhelmed — including a goose egg by Brandin Cooks. I notched another win and now have an 11-1 record and maintain sole ownership of first place. I also have secured a first round bye for Week 14. This week I played the Sunday afternoon slate (including SNF). I continued to play one roster, across ten total cash games; seven 3-man contests and three double up contests. This was a poor week for me — primarily due to A.J. Green getting hurt early in the first quarter, and scoring no points. I chalked this week up to a loss after that happened. 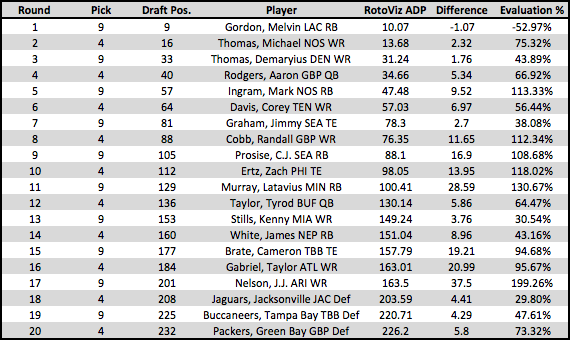 Injury excluded, Golden Tate and Martellus Bennett also underperformed. I also dropped some entries into a few free/cheap tournaments (again, with no success). I won 20% of my cash contests which is a bonus after the injury harming the lineup. This week I went 2-0 in my keeper and dynasty leagues. This week I scored 157 points and was the second highest scoring team this week. This week I was carried by a two-TD game from the Minnesota Vikings defense, and a 300+ yard, 3 TD performance by Dak Prescott. Big points from those two and solid performance from most other skill players, more than offset poor showings from Kyle Rudolph and Caleb Sturgis. CJ Prosise had a solid game, but sustained a season-ending foot injury after a 72-yard TD run in the first quarter. Big blow for my team that is pushing for the playoffs. With this win, I remain in fourth place with a 7-4 record. At 115 points — I was the third highest scoring team this week. This match came down to the Sunday and Monday night games — mostly due to a decision on defense. With the Denver Broncos defense on a bye, I was looking for a streaming option. Early in the week I plugged in the Detroit defense, but made a last-minute switch to the New York Giants. Detroit had two TDs and a number of other defensive scores that would have added another 11 points to my total. I was able to gain a 17-point lead after Sunday night, based on a strong 365 yard, 3 TD performance by Kirk Cousins and mediocre games by by Dustin Hopkins and Davante Adams. On Monday my opponent only had DeAndre Hopkins left. This play could have swung the match against me, but DeAndre Hopkins ended with a disappointing night. I notched another win and now have a 10-1 record and maintain sole ownership of first place. More importantly, my opponent this the second place player and I now have a 2-game lead over him. This week I played the Sunday afternoon slate (including SNF). I continued to play one roster in eight total cash games; five 3-man contests and three double up contests. This has been my formula for the past two weeks. I also dropped some entries into a few free/cheap tournaments (again, with no success). 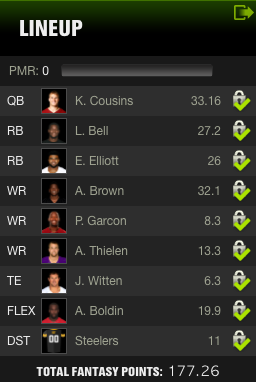 The below cash lineup was acceptable — particularly due to favorable scoring from from Diggs, Baldwin and Johnson. 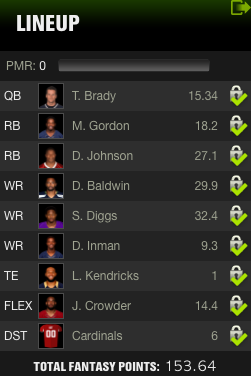 A few big misses from Kendricks and Brady kept this from being a strong lineup. I won 88% of my cash contests which made this another solid week. This week I scored 129 points and was one of the lowest scoring teams of the week. I was cute this week choosing JJ Nelson for the matchup against SF over Allen Robinson against HOU. JJ Nelson barely scored while Allen Robinson had 100+ yards, 9 receptions and a TD. Other players on my bench that outperformed my starters included CJ Prosise, Jamison Crowder, and Kenny Britt. Overall, it did not matter as the added points would not have been sufficient. Despite the loss, I remain in fourth place with a 6-4 record. At 155 points — I was the one of the highest scoring players this week. The biggest disappointment was Spencer Ware who only had 13 carries this week. I did make a last minute call to play Brandin Cooks over Davante Adams and Tyrell Williams — both who had better games — but it was not material for winning the week. I notched another win and now have a 9-1 record and maintain sole ownership of first place. This week I played the Sunday afternoon slate (including SNF). I continued to play one roster , this week across eight total cash games; five 3-man contests and three double up contests. I also dropped some entries into a few free/cheap tournaments (with no success). The below cash lineup scored very well. This was mostly due to plenty of good chalky decisions such as the Dak Prescott / Zeke Elliott stack, and Melvin Gordon. 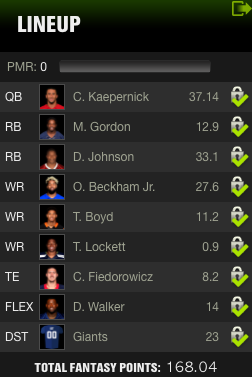 The only downside is I did not play this lineup in GPP as well. 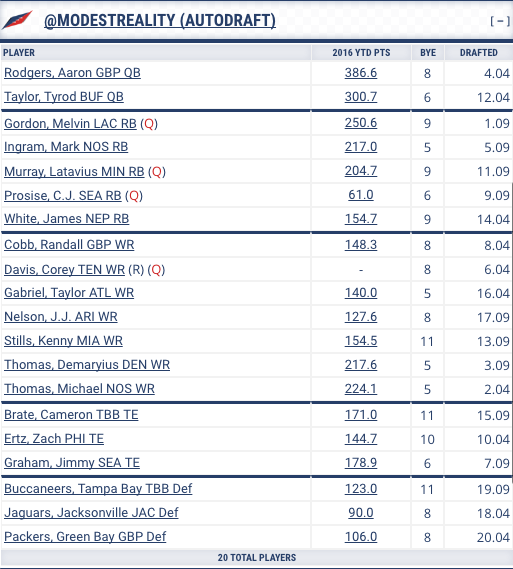 I opted for a pivot to the Derek Carr / Amari Cooper stack as Denver was missing Aqib Talib and I thought Oakland would be a sneaky play. They were — but it was the Latavius Murray show. I won 100% of my cash contests and this was overall an excellent week. I was proud that this lineup scored first in the three double-up contests as well. This week I scored 173 points (second highest for the week), notching a much needed two game winning streak. 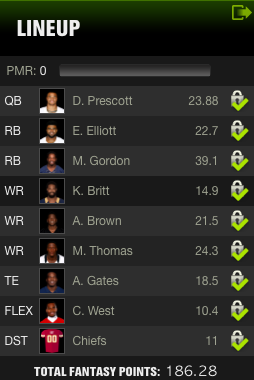 Overall my team performed well this week, highlighted by a monster game from Melvin Gordon. I also benched Derek Carr in an unfavorable matchup against Denver for Dak Prescott which worked out well. Again, two of the three teams ahead of me won which has shifted the top three spots — but has not affected me as of yet. It is important to note that I play the third place team in Week 10 which is a must win if I want to solidify my playoff spot (only four teams make it in this league). I remain in fourth place with a 6-3 record. At 94 points — I was the lowest scoring winner this week. My team was stunted with bye weeks (James White, Jeremy Hill, Kirk Cousins) and injuries (Spencer Ware). Most disappointing was an Oakland blowout win over Denver which was achieved through the running game. Not only did this limit the points by Derek Carr, but the Denver defense had a low scoring week. I was lucky to sneak by with a win this week since the team I played had a mediocre performance. As ugly as it was, a win is a win, and I have an 8-1 record and maintain sole ownership of first place. This week I played the Sunday afternoon slate (including SNF). 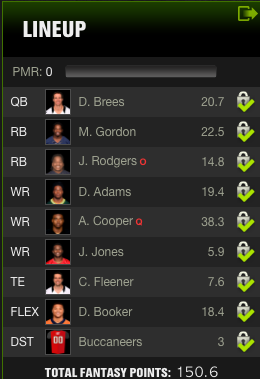 I made the switch to one roster across eight total cash games; five 3-man contests and three double up contests. I also dropped some entries into a bunch of free roll tournaments (and one dollar tournament). The below cash lineup scored poorly. This was mostly due to both Spencer Ware and T.Y. Hilton leaving their respective games with injuries. 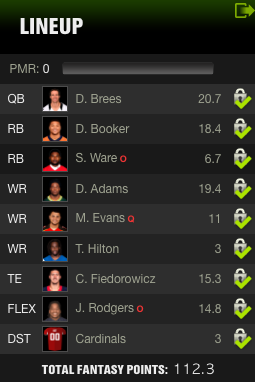 Otherwise, this lineup was setting up nicely to place in cash games. 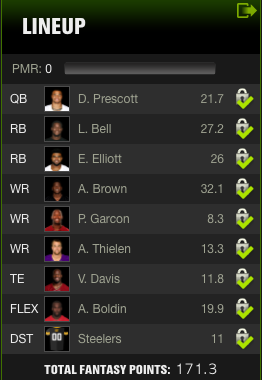 This next lineup is from my $1 tournament, which won a $2 prize. I won 13% of my cash contests and this was overall another poor week. I am definitely learning a lot about DFS this year and still have money left in my modest budget from the beginning of the year.